The class took place in the Madarin Bar of Mandarin Oriental, the home of Bar Boulud and the soon to open Dinner by Heston Blumenthal. Leading the class were David Hesketh MW, MD of Laurent-Perrier UK, and Lucia van der Post, journalist and author of “Things I wish my mother had told me”. 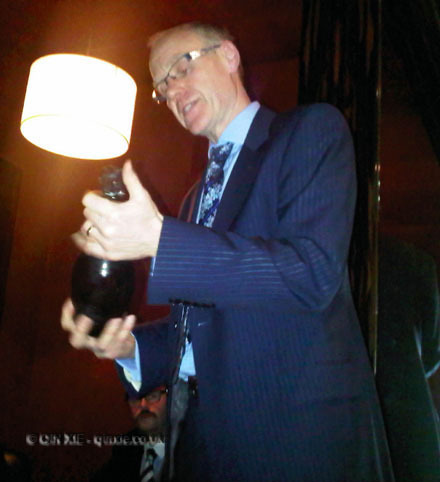 The focus was of course champagne and in particular, the selection from Laurent-Perrier. But back to the evening and learning about the art of entertaining. As the guests gathered at the bar, Laurent-Perrier Grand Siècle was served in classic champagne flutes and matched to savoury canapés. There was quite a selection, from wild mushroom risotto to roulade of Fois Gras, but the pan-fried scallops with parsnip purée and Alsace bacon and the smoked salmon with caviar on toasted Brioche were particularly excellent. For special occasion or Christmas lunch, you want something with real complexity. Heskeths suggests the multi-vintage Laurent-Perrier Grand Siècle – it even has its own special pewter holder. Experience Laurent-Perrier Grand Siècle yourself at the Mandarin Bar, available by the glass at £35. It is also available with its specially designed holder from Harrods and Selfridges at £350rrp. A selection of Laurent-Perrier Champagnes is available across the country from Laithwaites.co.uk.